So here we were, right at the opening of DB99 The Gin Drinker’s Line. Indian troops were sitting in trenches on a windy mountain pass, staring down advancing IJA troops bent on breaking through the last defence line between them and the capture of the entire Kowloon peninsula (Hong Kong). 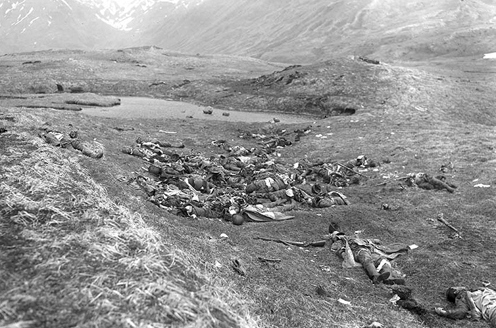 At a particular trench, defensive fire broke and routed two Indian squads from the trenches. A squad nearby advanced into the trench hex. IJA troops kept moving in and it was too late to get into the trench. One IJA squad broke through the grain fields straight up front, our squad pinned it down with First Fire. Good. Another IJA half squad raced by to the right and Subsequent First Fire failed to bring them down. The Indian squad was now out of guns and wishing for the enemy Movement Phase to end. From the swirling mist to the left, an IJA 8-0 leader at the tree line thrust his sword into the air and screamed : BAAAANNNNZZZZZZZAAAAAAAAAIIII!!! Two IJA squads pour out of the forest with the 8-0, running straight for our Indian squad. Staring Death in the eye, the Indians invoked Final Protective Fire, survived the Morale Check but failed to knock back the IJA horde. The Indians were locked in Close Combat with two IJA squads and a 8-0. With 2-1 Hand-to-Hand odds and the IJA -1 DRM, a DR of 10 would wipe the Indians out (92% probability). Sure enough, IJA rolled a 7. With death being a certainty, the Indians decided to take on all comers. Hand-to-Hand combat at 1-2 odds calls for a dice roll of 6. Since they were fighting the IJA, they needed a 5. Our squad rolled 1 & 3. They took the 2 IJA squads and the 8-0 leader down with them. Brian Youse pointed out the dangers of Hand-to-Hand (HtH) combat in his article “The Case for Infiltration” (ASL Journal 3). It is not a good idea to commit too many IJA troops to a HtH combat because of the high chance of mutual destruction. In our case H-t-H allowed the “dying” Indian squad to take out 1 IJA squad with a die roll of 6 (42% probability) vs 4 in normal close combat (17%), or 2 IJA squads with a die roll of 5 (28%) vs 3 in normal close combat (8%). This is an important note to self. This entry was posted in Game Play and tagged Advanced Squad Leader, ASL, board wargame, board wargames, Hand-to-hand combat, Hong Kong, IJA, Imperial Japanese Army, wargame. Bookmark the permalink. Nice example to provide the proof to that article. Were you the unfortunate Japanese or the victorious Indians?? Hey Joss, it’s mutual annihilation for this encounter. Neither side can really claim to be victorious yet! Japanese are as tough to play as they are to play against. The last bit of your comment is the most interesting. Try to have units enter the hex in different (Human Wave) phases so that the defender is forced to take multiple Final Defensive Fire Morale Checks … yes! Thanks so much for this!! Thanks for the plug Jackson, I learnt that the hard way, those 666 squads do not like those odds LOL. Even having just a squad and a leader in two hexes against Yanks tends to be the decider. “The Art of the Banzai” by Bret Hildebran? Sure running down a firelane can sure make you wish you had taken another route so it’s best to have already triggered that gun if you can tempt it with other targets. If the G has held it’s fire then at least you have got other units forward with no pain. Simply don’t Banzai that turn but keep the units able to wave banzai the next turn and repeat the process and chances are that the MG will fire at the supports leaving you then free to get going. Two most common mistakes are using the Banzai too early or it being too large or worse still neatly stacked in a huge pile that shrinks with every step. RIght … at the end of the day you play the player. Terrific food for thoughts! Hold the Banzai threat and milk it as long as you can. On the flip side it’s even more important to shoot at IJA leaders at the first opportunity, especially when they are so brittle!